2018 Grasshopper Midmount 327 EFI 52 in. Offering unparalleled performance and fuel economy, the Model 327 EFI features a closed-loop Electronic Fuel Injection (EFI) engine that continually adjusts the fuel ratio to use less fuel, provide reliable hot and cold starts, reduce emissions and minimize fuel-induced service issues. WARRANTY: Commercial Use: 3-year unlimited hours; limited warranty covering parts and labor. Residential Use: 4-year or 800-hour (whichever comes first); limited warranty covering parts and labor. QUIKADJUST DROP PIN HEIGHT ADJUSTMENT: Raise and lower the deck easily with foot pedal and drop pin for precision cutting heights between 1.0 and 5.0 inches. ULTIMATE OPERATOR STATION: ComfortZone™ seat eliminates jostles and jolts with coil-spring suspension and a fully padded, high-back seat, padded armrests and variable density foam cushion. 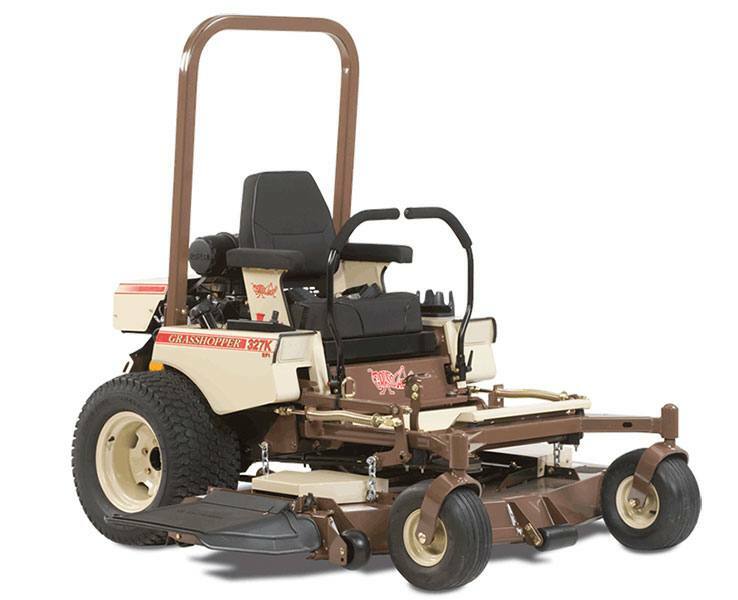 Iso-mounting smooths the ride, erases fatigue and keeps the operator comfortably in control at faster mowing speeds. Operational controls including throttle, choke and angled View-Eze™ console and adjustable cup holder are well positioned for visibility and ease of reach. One- or two-handed operation with ComfortReach™ adjustable Hydra-Smooth™ dual levers that automatically return to neutral from either forward or reverse position. Midmount 327 EFI 52 in. Residential - 4-year or 800-hour (whichever comes first); limited warranty covering parts and labor.